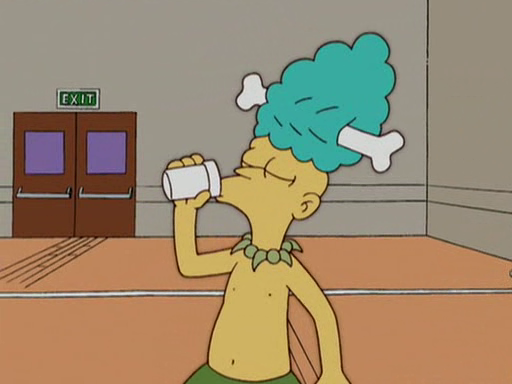 Principal Skinner: This orange drink is the only way to recoup our terrible losses from Fire Drill Follies. I just don’t know what went wrong. 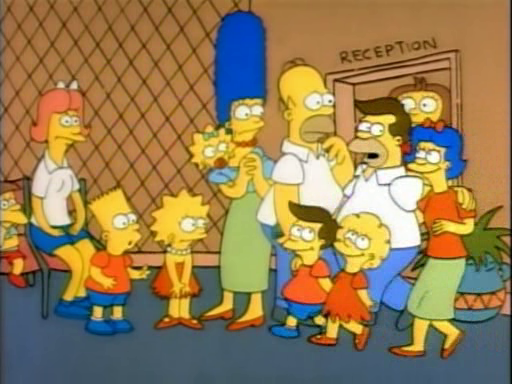 Groundskeeper Willie: You opened the show with a fire drill, and everyone cleared out. 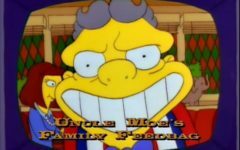 Principal Skinner: Mm. So Mother was right. It was my fault. Well, go ahead. Water it down some more. 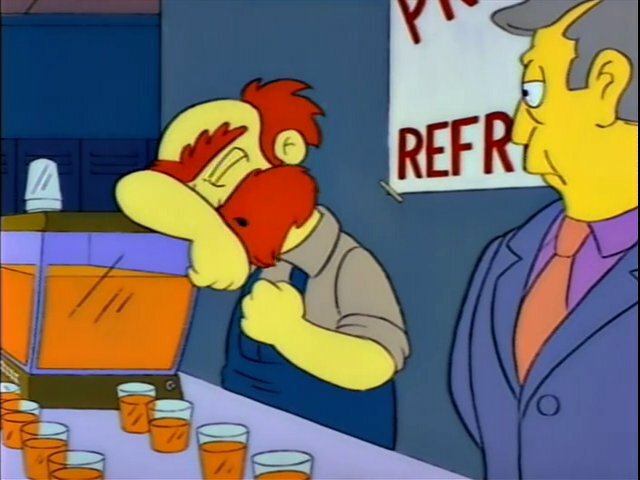 Groundskeeper Willie: My God, man. I’ve watered her down as far as she’ll go. I cannot water no more! Smash: Man, they’re gonna be big. And you stood in their way. 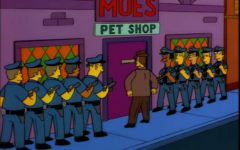 Skinner: No, I didn’t. I even came in early and made orange drink. 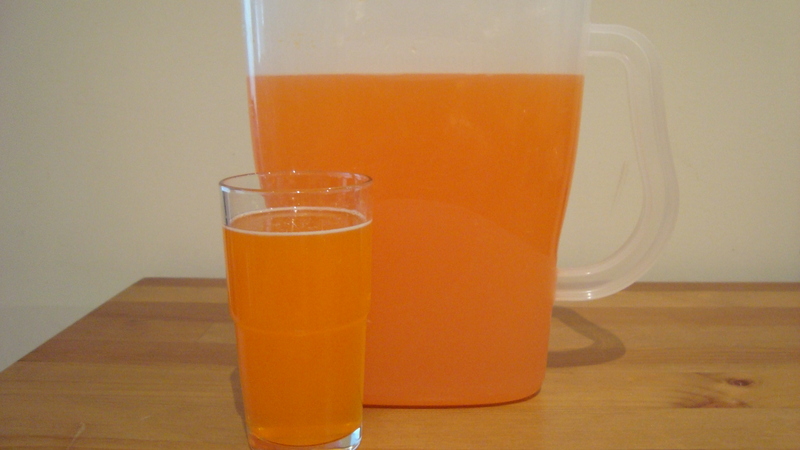 Smash: Orange drink? What, do you live with your momma? 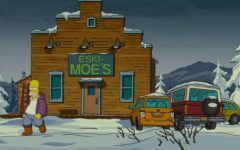 Skinner: She lives with me. Sideshow Mel: Can we move this meeting along? 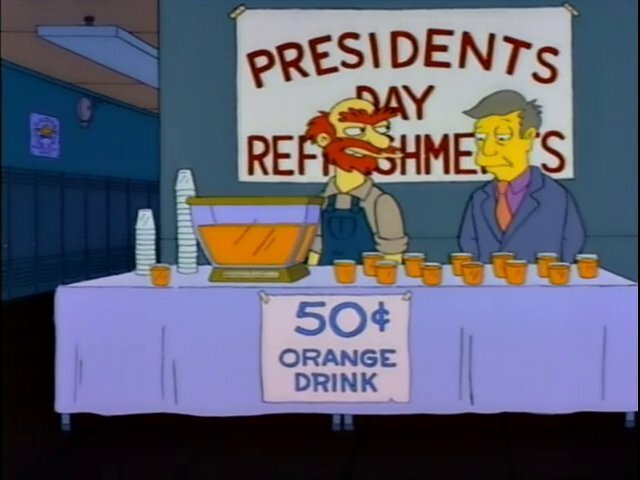 I pay my taxes, I expect my orange drink! Ambrosia! 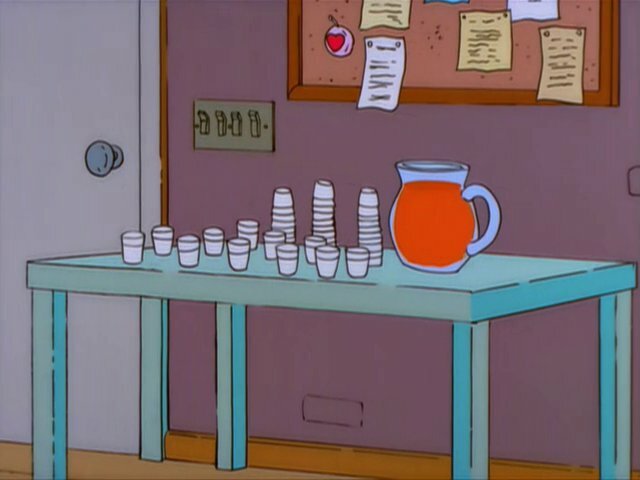 Principals Skinner’s Orange Drink, much like Frosty Chocolate Milkshakes, is one of those Simpsons references that hasn’t actually been run into the ground with constant referencing. It’s been a plot point several times over the years but my favorite is, of course, the watered down version from I Love Lisa. 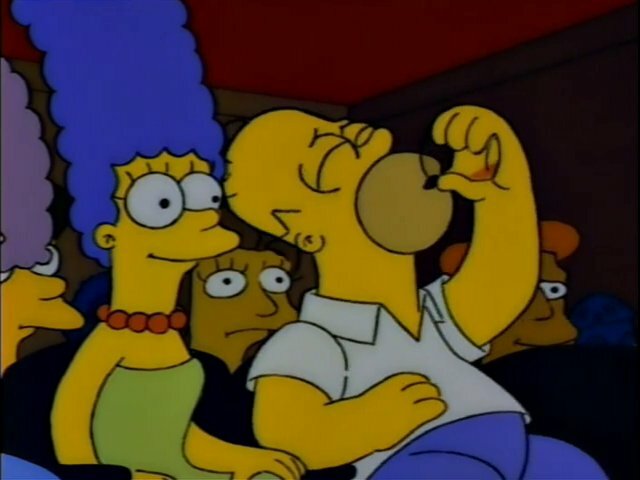 I also really appreciate that despite it being watered down Homer still seems to enjoy drinking it back, will I feel the same way? As usual, Wikipedia manages to be both informative and include somewhat dry humor into its definition of Orange Drink: “Typically such beverages contain little or no orange juice and are mainly composed of water, sugar or sweeteners, flavor, coloring, and additives, sometimes in that order.” So I decided to use the cheapest, easiest option for my Orange Drink, Orange Kool-Aid. Follow the directions on the side of the packet. Then water it down some more (I added another half a glass of water to this glass). 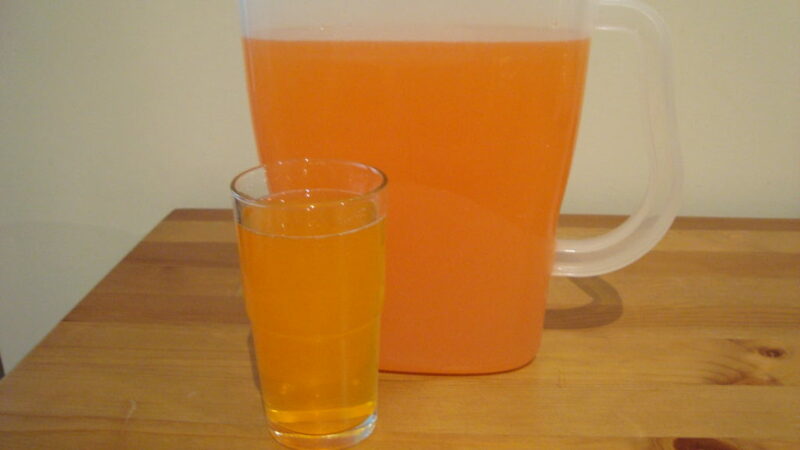 As a kid, did you ever go to a party where the parents didn’t add enough sugar to the Kool-Aid – either through ignorance or in a misguided attempt to keep the children from getting too rowdy? That’s pretty much what this tasted like. So overall, this didn’t taste bad, it just tasted watered down and isn’t that what Presidents Day is all about? Oh man, my eyesight is already kind of bad what with my glasses (Nerrrrrd!) but I supposed I can give this a try. This feels a little bit like last year’s scorching non-Wonder bread and properly-packaged baloney Super Bowl Spread scandal. 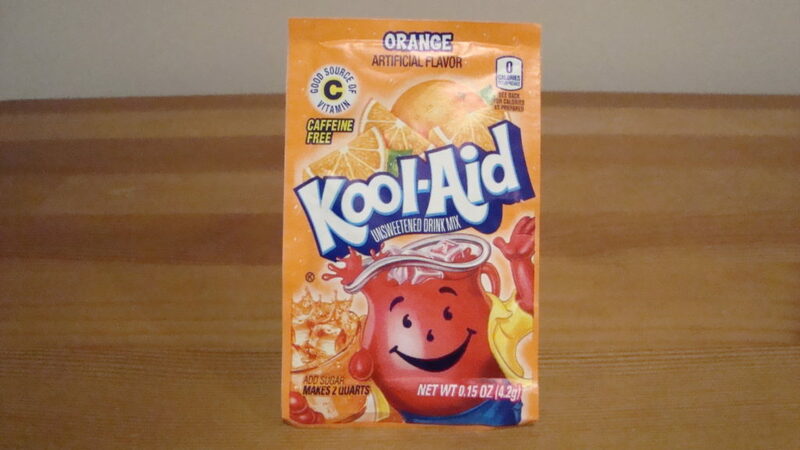 My elementary school frequently featured such orange drink and, even watered down, it wasn’t anywhere near Kool-Aid quality. There was a subtle element of stale cough syrup and earthy decay to it which does feature in any other liquid on the planet. 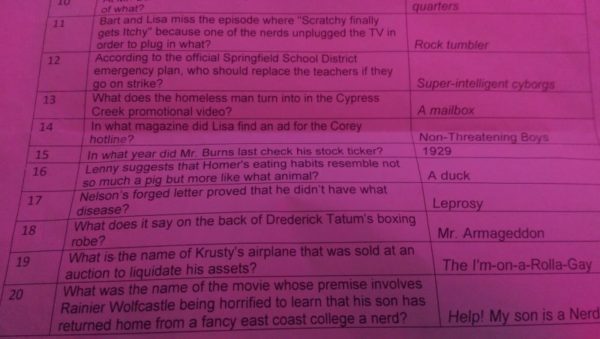 I don’t even know if it was off brand — it might have been something generated and distributed exclusively through the school system. Actually, I just Googled it and McDonald’s made it. Unexpected, yet… somehow not. McDonald’s orange drink is just orange Hi-C. I hear it goes great with Fluffernutters! Hi-C is hard to find outside of America, so while Kool-Aid is not a perfect replacement it’s the best I could do! You should make the Bundy Mimosa (beer and Tang). A Cracked writer did it in a fictional drinks article, though he cheated and used the kind that comes in one of those small squirt bottles. And I know you’d honor Al by making an authentic one with the powder. Well, considering that I’ve combined beer with a Lean Cuisine this sounds infinitely more delicious! And you’re right, this must be made with powered Tang otherwise the consistency will be all wrong.